When we decided to introduce chat on top of Redbooth’s many existing features, we wanted users to be able to quickly connect in a business context with team members online – sort of like the icing on our collaboration platform cake. We wanted you to be able to access and reference key information within one platform, and without any hassle. We just knew that this quick and easy way to communicate with other team members would help increase productivity and collaborate more effectively. And we were right. We are so excited about the idea of virtual teams being able to ask quick questions or share information with just a few keystrokes, allowing workers to maintain a steady flow and get things done with less distractions. Redbooth chat allows teams to communicate adequately, no matter where they are, and no matter what type of device they are using. With chat, we offer users another way to create, produce, thrive and succeed. But don’t just take our word from it. We’ve been receiving great comments from customers who are experiencing the benefits of chat – the icing on the cake – and we’d like to share them with you. “Redbooth’s chat feature has revolutionized the way that Team Zenplicity interacts on a daily basis. 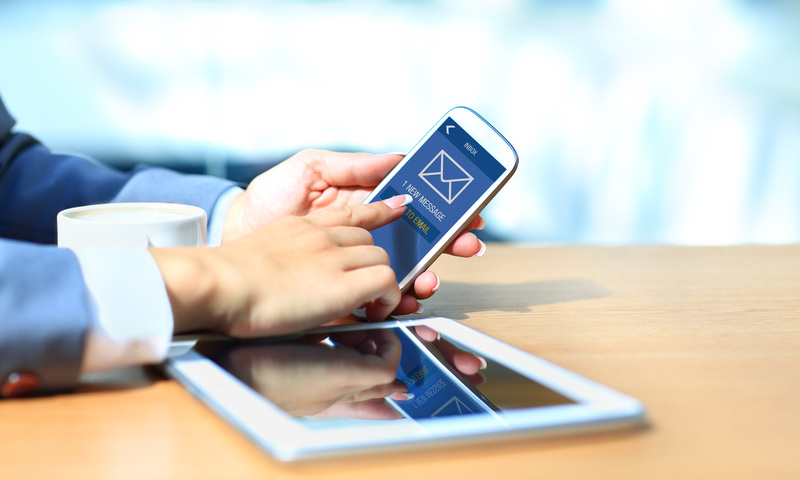 We’re able to work more efficiently and collaborate more effectively in real time without having to wait for an email or notification to hit our inbox. We are loving the new Redbooth chat, and are already using it throughout the company. We have people working from home or other locations, so Redbooth becomes our “online office.” We communicate with each other there, and we like being able to chat without mixing work with our personal communications. The new chat has helped us speed up processes and resolve questions in a shorter time, plus since the conversation happens at our “online office”, everything said there stays professional and work-related. Overall the chat has been a great addition, making us more connected, and efficient. With the Redbooth app on my phone I can contact coworkers faster and I can access all the information there; or I can use my personal laptop if I need something last minute from home. We love Redbooth chat, especially the mobile capabilities for our team. Along with video meetings, it’s helping us so much with our remote staff. We feel Redbooth chat was tailor-made for us. We love using project-based chat to communicate real-time with clients, and one-to-one when want to reach out quickly to our internal team. Before Redbooth chat, we worried about bothering someone on their personal time — now, when we see our teammates on Redbooth we *know* they’re at work & ready to have a chat. We are big fans! Our law firm has offices in throughout the US and EU, and we’re constantly connected internally and with our clients using Redbooth chat. I can get the status on any of my client work within seconds – anytime, anywhere. We love the chat feature! Redbooth chat makes life so much easier and has eliminated the multiple trips a day to each other’s office for a “quick” question. We have offices across the western US and chat makes it feel like everyone is here with us rather than in another state. Chat is such a great feature, thank you Redbooth! We are a graphic design and web development group located in various locations around the globe and we love the ability to see the job status and updates. 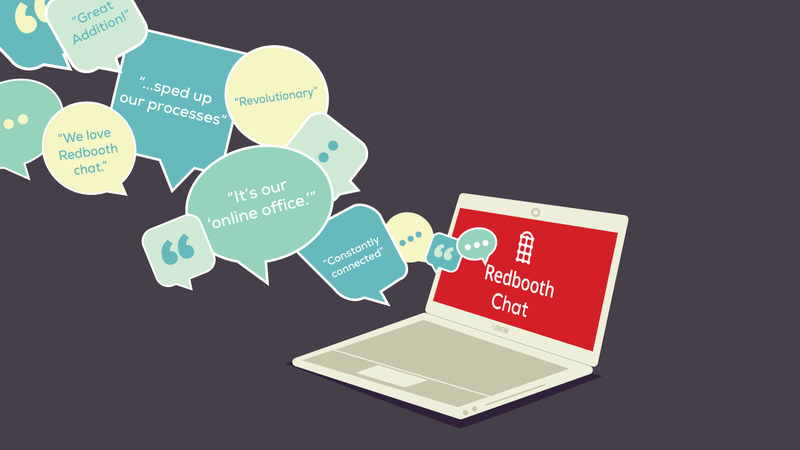 Redbooth chat has been a great addition to allow us to communicate in real-time about a job. Now, instead of switching over to do our instant messaging, we’ll be using Redbooth chat instead. 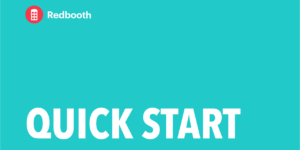 We work in an open office space, and with Redbooth chat, folks can get quick answers on things without talking loudly, getting up to go over to a different desk, or adding to our collective email death piles. We’re very pleased with chat and with Redbooth as a whole. The best thing about Redbooth chat is that it helps people communicate and concentrate on tasks in a more sprint-like manner. 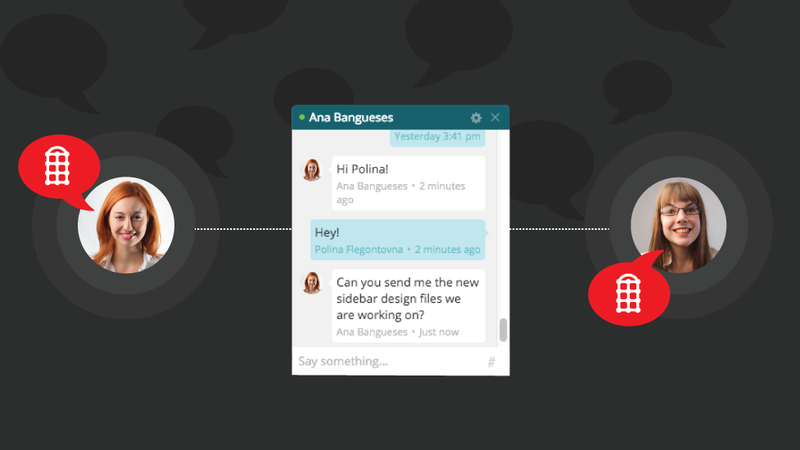 Redbooth chat has been incredibly helpful – it has dramatically cut down our emails for projects. I genuinely love Redbooth and how it has helped our small digital marketing company grow into a full marketing agency. As you can tell, we love customer feedback! We enjoy hearing how chat is helping users with their projects, workflow and collaborative efforts. This is why we’d really like to hear from you. If you have a story to tell us about chat and how it’s helping you or your team, please leave your comments below.